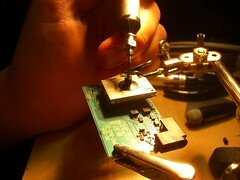 I recently bought an Aoyue hot air reflow station so I could do SMT soldering faster and more easily. £90 on ebay - bargain! As I repeatedly say, there's nothing magic about surface mount stuff - it can be soldered easily by hand with an ordinary iron and a little practise. 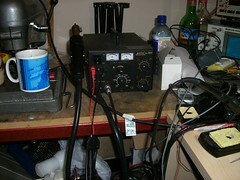 However, hot air reflow does allow one to solder BGAs. 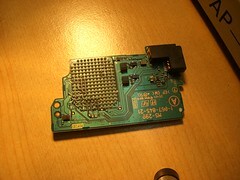 A friend came to me with a PSP wifi module with an insane problem - all the joints on the BGA had failed, and the module just sheared off, leaving perfectly tinned pads on the module, and perfect flat-topped balls on the PCB! Presumably it wasn't quite soldered correctly at the factory. I added flux with a flux pen, and reflowed the balls so they were all nice and shiny and rounded again. 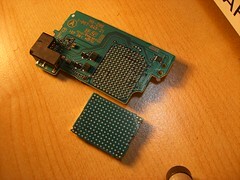 Then I preheated the pcb from the back and front, to prepare for soldering the BGA. 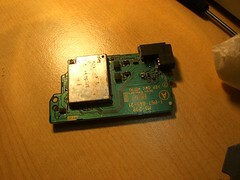 I removed the sticker from the top of the module so it didn't burn. Flux was applied to the back of the module. I aligned the module roughly (the balls of solder do the rest) using a vacuum pick-up tool - a little freebie that came with the reflow station. I tried to be fairly quick so the board didn't cool down too much. Then I heated the module mostly from the top. I heated it fairly gently over about a minute, heating a little more strongly towards the end. I poked the module with a screwdriver to feel whether the balls had melted. They had - the module wobbled on the surface tension like jelly. I didn't take any photos, as I was too busy worrying about whether I was overheating it! 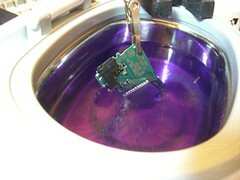 I let it cool, then washed it in the ultrasonic bath with methylated spirits to remove the flux. Nick reported that the module worked fine. I had slightly overheated a connector on the back, so it was a tight fit, but the board worked ok. Submitted by Andre (not verified) on Thu, 01/01/2009 - 14:12. Hi there.. This is a very interesting repair trick, as I have a few Philips and other monitor PCB's here which don't turn on/stay on then shut down. I did find that in a lot of cases the 2SC5706/5707 transistors go bad due to old age, replacing these does sometimes work as long as the secondaries are OK. The best way to test them is to measure their gain on a Peak Atlas, if they measure the same they are probably OK. If one is really low then it is unbalancing the bridge and can cause a shutdown. Another fault I ran into is shorted/open HV secondaries. This can be checked by measuring with a DMM, if they measure significantly different or one is much lower than the rest then it is bad. Usually you can tell by looking at the underside for charring and/or melted labels. Replacements can be fabricated if you have a donor PCB with a similar transformer, just wind the correct number and gauge of turns then test, possibly replace in pairs just to be safe? As a last resort these *can* be run with only two of four tubes on a single transformer pair. It is possible to reroute the wiring so one of each pair is used to avoid a dark area. This also requires modifying the circuitry slightly but if the monitor is destined for the bin anyway then it is preferable. Submitted by jeux casino (not verified) on Wed, 08/11/2010 - 09:09. Submitted by drew bitsko (not verified) on Mon, 09/19/2011 - 12:47. I found the information quite helpful.Thanks for sharing this excellent information.I was in search of this vital information since long time. Submitted by ammi (not verified) on Tue, 10/04/2011 - 07:40.
stock). I can not make the model you have. Submitted by Anonymous on Sat, 08/25/2012 - 06:39. As far as the glue is concerned for this kind of painting, PVA (Polyvinyl Acetates) glue is highly recommended. It comes is white semi liquid form, but the highlight here is the fact that it dries clear, without leaving a stain on it. It is essential that you fix clip cloth to the canvas while you are gluing it. auguste renoir add acrylic gesso to the glue to give it a very crisp and fine finish so that auguste renoir painting has an even background. While gluing, care needs to be taken to no bubbles are formed as it will hamper the complete painting. Hence, one must look out for any bubble outbursts that threaten to come off. Submitted by Anonymous on Sat, 08/25/2012 - 06:50. In this blog post we’ll discuss about suitable canvases and glues that are used for [http://www.wholesaleartmall.com]asian oil painting[/url]. These are two essential aspect of the art which keep the painting younger and fresh looking without messing with the colour or design in the coming period. Canvases of varieties are easily available in the do0it-yourslef stores or your local stationary store. For [http://www.wholesaleartmall.com]asian oil paintings[/url] especially, there are a few cloth based canvas options which include- cotton, linen and denim. Each of these formats brings in their unique texture. On the other hand, wool and silk are not recommended at all. You could even pick some old shirt, pillow cover, curtain as the canvas; just ensure that they are not strongly coloured. Submitted by Anonymous on Mon, 08/27/2012 - 15:16. Why would one search by email address? It's possible but hard to achieve without a good email finder. Submitted by Anonymous on Wed, 07/13/2016 - 23:30. Submitted by Anonymous on Fri, 03/30/2018 - 15:12. Submitted by Anonymous on Sun, 10/14/2018 - 17:42. Submitted by Anonymous on Fri, 09/15/2017 - 08:47. Submitted by Anonymous on Sat, 03/09/2019 - 20:13. Submitted by Anonymous on Wed, 05/23/2018 - 15:03. Submitted by Anonymous on Thu, 11/12/2015 - 03:23. Submitted by Anonymous on Wed, 09/12/2018 - 06:47. Submitted by Anonymous on Mon, 11/23/2015 - 21:50. Submitted by Anonymous on Sat, 12/17/2016 - 05:46. Submitted by Anonymous on Fri, 03/10/2017 - 03:09. Submitted by Anonymous on Sat, 08/19/2017 - 09:31. Submitted by Anonymous on Fri, 02/01/2019 - 06:01. Submitted by Anonymous on Mon, 04/15/2019 - 20:32. Submitted by Anonymous on Tue, 09/12/2017 - 19:54. Submitted by Anonymous on Thu, 09/13/2018 - 12:27. Submitted by Anonymous on Thu, 03/27/2014 - 05:53. Submitted by Anonymous on Thu, 09/17/2015 - 07:27. Submitted by Anonymous on Sat, 10/17/2015 - 06:22. Submitted by Anonymous on Wed, 04/06/2016 - 06:27. Submitted by Anonymous on Wed, 03/23/2016 - 02:38. Submitted by Anonymous on Thu, 07/28/2016 - 20:31. Submitted by Anonymous on Fri, 09/14/2018 - 16:36. Submitted by Anonymous on Mon, 11/14/2016 - 17:13. Submitted by Anonymous on Sat, 05/19/2018 - 04:35. Submitted by Anonymous on Sat, 09/09/2017 - 13:48. Submitted by Anonymous on Thu, 01/04/2018 - 10:48. Submitted by Anonymous on Tue, 11/20/2018 - 15:13. Submitted by Anonymous on Mon, 03/04/2019 - 21:53. Submitted by Anonymous on Fri, 02/12/2016 - 23:30. Submitted by Anonymous on Fri, 02/19/2016 - 07:53. Submitted by Anonymous on Thu, 03/10/2016 - 01:18. Submitted by Anonymous on Sun, 05/08/2016 - 01:39. Submitted by Anonymous on Fri, 09/08/2017 - 14:08. With havin so much written content do you ever run into any issues of plagorism or copyright violation? My website analisis has a lot of exclusive content I've either created myself or outsourced but it seems a lot of it is popping it up all over the web without my permission. Do you know any ways to help protect against content from being ripped off? I'd certainly appreciate it. Submitted by Anonymous on Sun, 08/19/2018 - 17:42. Submitted by Anonymous on Sun, 05/21/2017 - 16:42. Submitted by Anonymous on Fri, 12/29/2017 - 17:22. Yes! Finally something about magic tricks. Also visit my web page :: Marco S.
Submitted by Anonymous on Fri, 09/07/2018 - 01:24. Submitted by Anonymous on Mon, 05/16/2016 - 08:42. Submitted by Anonymous on Fri, 07/29/2016 - 23:46. Submitted by Anonymous on Thu, 08/17/2017 - 11:43. Submitted by Anonymous on Fri, 06/29/2018 - 04:09. Submitted by Anonymous on Wed, 04/17/2019 - 07:27.